Click to viewWhen looking at the iPod touch, you have a choice: you can either see it as an evolutionary leap for iPod, or a slight downgrade from iPhone. You gain a thinner shell, up to 16GB of storage, but lose a bunch of apps, the phone, and some other surprising things. In our opinion, it's both the leap and the downgrade, and therein lies the rub. • Physically, it's almost more of an attention grabber than the iPhone, at about 2/3 the thickness and wearing the signature iPod chrome jacket. Yes, the back is more prone to scratching, but it's oh so shiny. Removing the recessed headphone jack was also a smart move, as you no longer need compatible headphones, or a silly adapter to make it work. • Much of the iPhone experience remains intact: the wonderful multitouch navigation, the supreme Safari browser, the ease with which you can sync to iTunes, then grab and go without that annoying Eject delay. 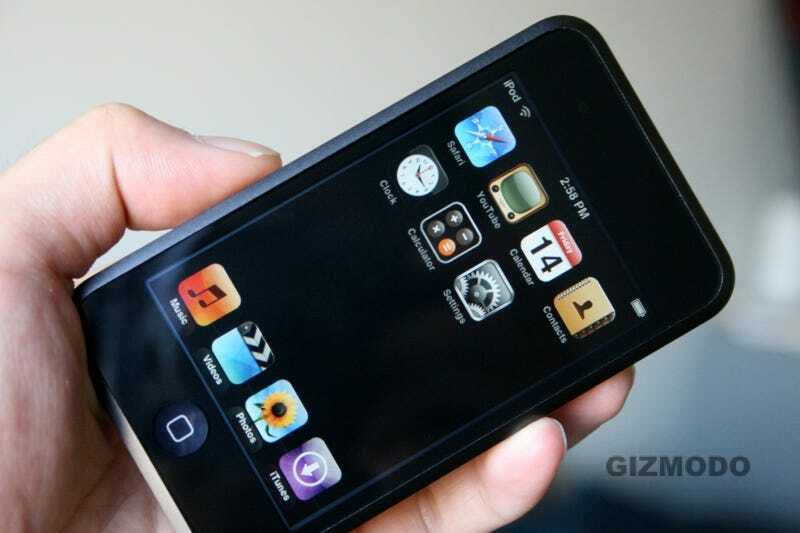 New minor features like adding a period by double tapping the space bar and bringing up the music HUD by double tapping the Home button are both welcome additions that make using the iPod touch even easier. • Our biggest complaint is that the touch's screen is not as good as the iPhone's screen. As Adrian has already mentioned, when you look directly at the screen while playing video, the deep blacks look strange and opalescent, almost like a film negative. We have tried this on three iPods and they all returned the same result. The only way to solve this problem, in my experience, is to tilt the touch away from you slightly, so that the top left corner is angled down. Not a fun way to watch video. The iPhone does not have this problem in any noticeable way. • One of the quieter breakthroughs of the iPhone was the physical volume buttons on its side. We were hoping this was a sign that Apple had recognized the need for quick, no-look volume adjustments. With an iPhone, you can turn volume up or down without pulling it out of your pocket. We view the lack of physical volume buttons on the iPod touch as a step backwards. • We found that there can be some lag when doing video-intensive activities. We were trying to find a single frame of a movie to show off, and we skipped forward and back so much that the thing eventually just froze up for a spell. After say 10 seconds, it was back in action, but everyone hates a freeze. The software can also experience crashes in the same way iPhone apps do: the app you're in closes out quickly, and you have to relaunch. Fairly painless, but potentially annoying. • Old iPod video accessories don't work with the iPod touch. As we reported with the nano, the iPod touch doesn't support video through its headphone jack. All future video out will be through the 30-pin connection, but old third-party video products using the pin connector don't work either. While future products are on the way, anyone with old hardware is going to have to upgrade. On the bright side, component video out is now supported. • No disk mode. We're not quite sure why this disappeared on the iPhone to begin with (cellphone data sensitivity, perhaps? ), but its the same on the iPod touch and we don't like it one bit. • Here are some less extreme gripes we'll just get off our chest: No video downloads in iTunes Wi-Fi Music Store, no wireless syncing to iTunes, no external speakers, dumbing down the calendar, and no Mail or Notes apps. This falls into the same category as our bitching about the lack of stereo Bluetooth A2DP on the iPhone: would be nice, might happen with a software update. Seriously, Steve, we're just planting the seed. • So far, we've had no luck with AppTapp, but we don't think that it will be long before we can load third-party apps onto the touch, too. The bottom line, if there is one, is that this will certainly be a great product for people who are unable or unwilling to sign up for AT&T. But spending $399 on the 16GB touch is not better than spending $399 on an 8GB iPhone. There are real reasons why the iPhone is a better iPod than the touch, especially now that both will have equal access to the iTunes Wi-Fi Music Store. Choosing the touch over the iPhone is like choosing a fully loaded Toyota Avalon over a Lexus ES. Additional reporting and research by Adrian Covert and Ben Longo.